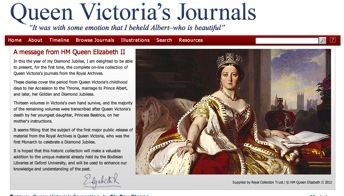 I stumbled upon this online exihibit of Queen Victoria’s Journals while on Twitter, from @AndrewSBowman. It is a collection of Queen Victoria’s writings detailing her life and experiences, which are pretty unique and amazing to read about, but it also illustrates her drawings and paintings. I knew that Queen Victoria was an artist; I had seen some of her sketch books come up on Antiques Roadshow, but I was still amazed to see how much she documented. It is strange to think that the royal figures whom she sketched were not just generic princes and princesses, as many young people might doodle in their sketchbooks, but people she actually knew and conversed with. It makes you think about how different a life she had from the everyday person. What do you think of her journals?